Turn any ground level area into a functional loading dock. 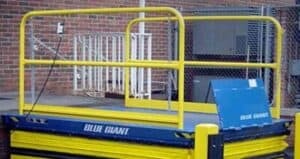 A hydraulic dock lift is a simple and flexible means of accommodating vehicle height variations. Dock lifts or elevating docks can be built in almost any size and capacity required for your application. They provide the ability to service trucks at any height and can also offer access to ground level for fork trucks. Pit mounted dock lifts are capable of height adjustments between 0" and 59". Greater efficiency can be achieved by utilizing a dock lift wide enough to allow side-by-pallet loading. It is also common for a dock lift to be set into a three-sided pit, recessed into the dock wall. It can also be mounted at the face of the dock, but may be an unwanted obstruction. Dock lifts are also available in a low-profile design to facilitate ground to truck loading / unloading without the necessity of a pit. This is particularly beneficial when dealing with a hand pallet truck and low volume product movement. When incorporating a dock lift into the overall dock design, it is important to choose a unit that will offer the greatest flexibility for the loading operations. Efficiency should always be one of the most considered factors. Dock lifts must be raised and lowered for each product transfer from dock to trailer; consequently they are less efficient than dock levelers. Typically, a dock lift will cost 1/3 the price of a fork lift truck and will have a quick and favorable payback when compared to the long-term cost associated with operating a forklift and manually loading / off-loading a trailer. The LoMaster Dock Lift Series will also greatly reduce handling costs, cargo damage and employee injury common to vertical transfer operations.